Born on this date: Samuel Goldwyn in 1879; Harlan Briggs in 1879; Charles Judels in 1882; Monty Woolley in 1888; Mae West in 1893; Dewey Robinson in 1898; Lorraine Bridges in 1906; Evelyn Ankers in 1918; Maureen O'Hara in 1920; and Donald Buka in 1920. Classic Movie Daily subscribers will find images of Monty Woolley, Lorraine Bridges, and Mae West towards the bottom of today's issue, plus a smaller shot of Maureen O'Hara at the bottom of this page. Today's mailing also includes some clippings marking Mae West's arrival to the movies, plus a new Lightning Review. —Monday, TCM Summer Under the Stars, Lee J. Cobb day (TCM.com link). After the opener, Men of Boys Town (1941 - 6:00 am), most of the Cobb oldies are stacked together later in the evening: Thieves' Highway (1949 - 8:00 pm); 12 Angry Men (1957 - 9:45 pm); On the Waterfront (1954 - 11:30 pm); and Anna and the King of Siam (1946 - 1:30 am). It's sure to be a loud day! —Tuesday's Summer Under the Stars spends 24 hours with Vivien Leigh (TCM.com link). 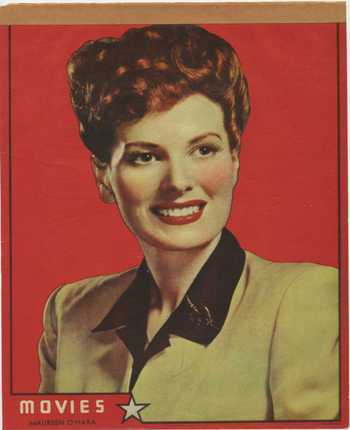 —Happy 95th Birthday to Maureen O'Hara! —Email subscribers will find a Success at Any Price lightning review in today's mailing. This one played on TCM late Friday night for Douglas Fairbanks Jr. day—I'd intended to include it in Friday's mailing, but, as you may remember, I tired out a bit too early Thursday night! It's an interesting movie, so I hope you caught it, but if not, look for it on the Watch TCM app, where it will remain available through August 23. —I spent a good part of last week reading several excellent Barrymore-related reviews and articles that were posted as part of "The Barrymore Trilogy Blogathon" hosted by In the Good Old Days of Classic Hollywood - All of the participating posts are linked HERE.